In 5-quart Dutch oven, add popcorn and oil. Tilt Dutch oven to spread popcorn evenly. Cover and cook over medium-high heat until 1 kernel pops; remove from heat. Let stand 1 minute, then return to heat. Cook, shaking pan occasionally, until popcorn stops popping. Immediately pour into serving bowl. 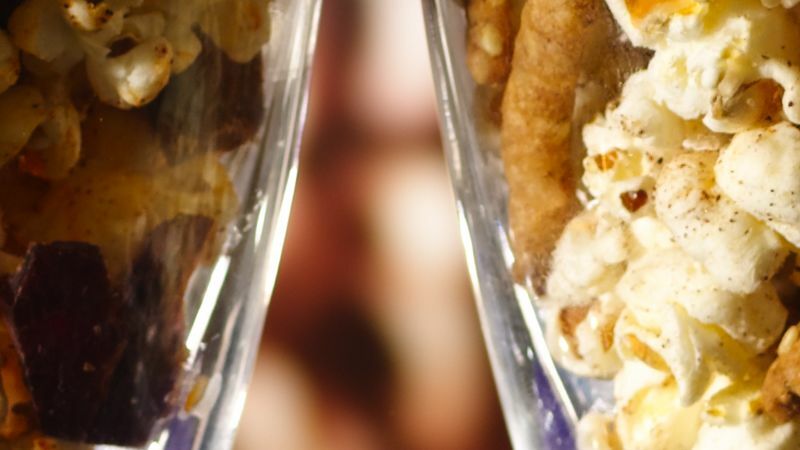 Pick a flavor to add personality to your popcorn. Sugary Sweet Flavor: Stir together 2 tablespoons granulated sugar, 3/4 teaspoon ground cinnamon, 1/4 teaspoon salt and 1/8 teaspoon ground ginger. Drizzle 2 tablespoons melted butter over warm popcorn; toss to coat. Sprinkle with spice mixture, and toss until evenly coated. Stir in 1 cup milk chocolate chips. Angry Jerk Flavor: Stir together 1 teaspoon ancho chile powder, 1/2 teaspoon salt, 1/4 teaspoon dried oregano leaves and 1/4 teaspoon chipotle chile powder. Drizzle 2 tablespoons melted butter over warm popcorn; toss to coat. Sprinkle with spice mixture, and toss until evenly coated. Stir in 1 cup coarsely chopped beef jerky. Flaky Nut Flavor: Stir together 1 teaspoon brown sugar, 1 teaspoon garam masala, 1/2 teaspoon curry powder and 1/2 teaspoon salt. Drizzle 2 tablespoons melted butter over warm popcorn; toss to coat. Sprinkle with brown sugar mixture, and toss until evenly coated. Stir in 2 cups salted cashew halves and 1/2 cup toasted coconut. Worldly Spice Flavor: Stir together 1 teaspoon granulated sugar, 1 teaspoon five-spice powder, 1/2 teaspoon salt and a dash cayenne pepper. Drizzle 2 tablespoons melted butter over warm popcorn; toss to coat. Sprinkle with sugar mixture, and toss until evenly coated. Stir in 2 cups sesame sticks. To toast coconut, sprinkle in ungreased heavy skillet. Cook over medium-low heat 6 to 14 minutes, stirring frequently until browning begins, then stirring constantly until golden brown.